Today my Gentle Readers I have a real treat for those of you into a little history with your storyline. I wasn’t sure if I would like this or not at first, because it is a far cry from my usual science fiction/fantasy reads. However, these authors won me over with their conversational style and intriguing plot. The ultimate conclusion is very touching. The 45th Nail is a journey of discovery. Robert Svenson is content with his lot in life: teaching French, loving wife, and growing son. A mysterious letter and package from an uncle thought dead for over 40 years changes all that. Now Robert begins a journey to Italy, while telling his wife he’s in Paris working on his French. Robert’s journey doesn’t start off the way he expects and just gets further off the rails from there. As he tries to understand just what kept his uncle from coming home from World War II, he gets a lesson in Italian history before, during, and after the last Great War. Surprises abound for Robert. Not just about his uncle’s life, but just what he is capable of himself. A journey like this changes a person in ways they would never expect. Bob’s Uncle weaves a tale of ancient history overlaid with a soldier’s journey through the Allied invasion of Italy. If you understand Italian and French you will probably enjoy this book more. Even so, the author gives us enough explanation to get the gist of almost every sentence in each foreign language when he uses them. 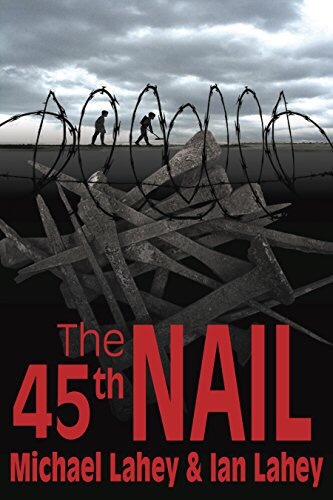 If you like a journey of self discovery overlaid with a bit of history and dark humor, get your copy of The 45th Nail today. This entry was posted in Book Reviews, Uncategorized and tagged etruscans, ian lahey, italy, michael lahey, roman history, romans, soldier, the 45th nail, world war 2, world war II, WW2, wwII. Bookmark the permalink.